The Boston Globe and Boston Herald have more often than not been defined by their differences—broadsheet versus tabloid, liberal opinion pages versus conservative opinion pages and paper-of-record versus feisty underdog. This study also found numerous differences in the coverage of the race between the two papers. During the primary season, neither paper devoted anywhere near the percentage of its coverage to the question of who was running as the AP and New York Times did. However, the Herald (20% of its primary stories) followed that theme more closely than the Globe (11%). The Globe, however, devoted considerably more attention than the Herald to one major aspect of the campaign: 14% of its stories during the primaries and general election were about the candidate debates, compared with 9% for the Herald. For the primary and general election campaigns combined, the Globe produced moderately more coverage on domestic policy issues (15%) than the Herald (12%). During the last two weeks of the general election campaign, however, the Globe far outstripped the Herald in domestic policy coverage—24% to 9%. The intensity of coverage for both papers picked up from January 6-19. But in the final week (January 13-19) of the general election campaign, the Herald flooded the zone with coverage, producing 58 stories on the race. That substantially outpaced the Globe, which produced 37 stories. But nowhere were the differences between the two papers more evident than in the tone of coverage toward the candidates, something that emerged in the primaries but became even clearer in the final two weeks of the general election. 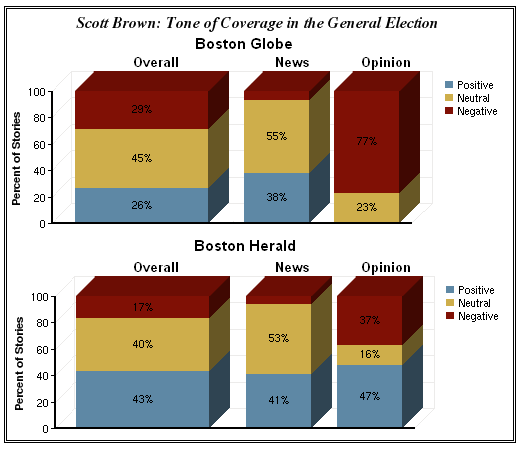 From January 6-19, the Herald’s coverage was much more positive for Brown than it was for Coakley. For Brown, 43% of the stories were positive, 17% negative and 40% neutral, compared with 14% positive for Coakley, 63% negative and 24% neutral. The Globe, on the other hand, was more positive for Coakley (38% positive) than Brown (26%), while both candidates received the same amount of negative stories at 29%. Another 33% of the Globe stories about Coakley were neutral, compared with 45% neutral for Brown. Some of the differences in tone for the papers can be explained by the opinion and editorial pages. The op-eds and editorials in the Globe about Coakley were more negative than positive (36% positive, 50% negative). But she still fared better on those pages than Brown (0% positive, 77% negative). The opinion pieces in the Herald were more supportive of Brown (47% positive, 37% negative, compared with 9% positive, 91% negative for Coakley). But it was the news reporting that accounted for most of the differences between the papers. For the Globe, both Coakley (39%) and Brown (38%) received about the same amount of positive news reports, although Coakley generated more negative stories (19%) than Brown (7%). In the Herald, however, the straight news reporting was far more favorable to Brown (41% positive, 6% negative) than to Coakley (17% positive, 44% negative). That dramatic disparity may reflect to some extent the tabloid tradition of inserting more voice and advocacy in the news pages. Herald columnist Margery Eagan described some of the motivation behind those differences when she appeared on CNN’s “Reliable Sources” on January 24. The Globe and Herald also provided different portraits of the candidates during the primary campaign from September 1-December 8. And to some degree, both papers’ coverage was in line with the choices their editorial boards would make about the candidates. The Herald, for instance, would end up endorsing Michael Capuano in the Democratic primary, and his overall coverage in the paper was noticeably less negative than in the Globe, and more neutral. While 35% of the stories about Capuano were positive in both papers, only 19% of Herald stories about him were clearly negative, while 33% were clearly negative in the Globe. That pattern was even truer of coverage of Alan Khazei, the candidate that the Globe endorsed. Fully 55% of stories about him in the Globe were positive in tone, and only 3% were negative. In the Herald, by contrast, stories were less than half as likely to be positive (23%), while 54% were mixed, and 23% were negative. Meanwhile, Pagliuca didn’t fare particularly well in either paper, but the Herald’s coverage (21% positive and 41% negative) was less flattering toward the wealthy candidate. The tone was considerably more mixed in the Globe, where positive stories narrowly outweighed negative ones 33% to 29%. There were also significant differences in the papers’ treatment of the Democrat who won the primary handily. More than half (52%) of all of the Globe’s primary stories about Coakley were positive, compared with only 30% in Herald. And the Herald ran a substantially higher percentage of negative stories (38%) about her than the Globe did (23%). There is perhaps some irony in how the papers covered the eventual senator, Scott Brown, in the primaries. That is, when they covered him, which was not very often at that point. Even so, the Globe’s primary coverage of the Republican was more favorable (59% positive and 6% negative) than the Herald’s (38% positive and 13% negative). But that trend was certainly reversed during the final two weeks of the general election.